Great review of the Dyson Pure Cool air purifier in the press. This Dyson’s air purifier that passed our scientific standards and joined our asthma & allergy friendly® Certification Program is explained to be of great help in reducing allergens and also to be trustworthy because it has been certified by our scientific program. 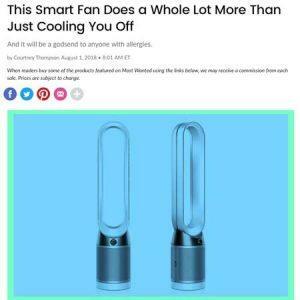 “And for my fellow allergy sufferers — or for the parents of kids with allergies — I’ve been keeping my tower fan in my bedroom at night for the past month and have been sleeping much more soundly, with zero sinus issues during the day. I also find a great amount of comfort in the fact that Dyson purifiers are certified asthma- and allergy-friendly by the Asthma and Allergy Foundation of America.” said Courtney Thompson.